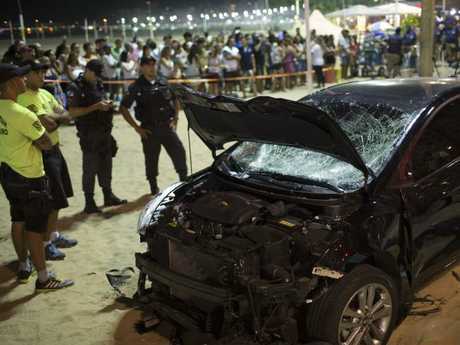 A CAR has ploughed onto the crowded seaside boardwalk along Copacabana Beach in Rio de Janeiro. 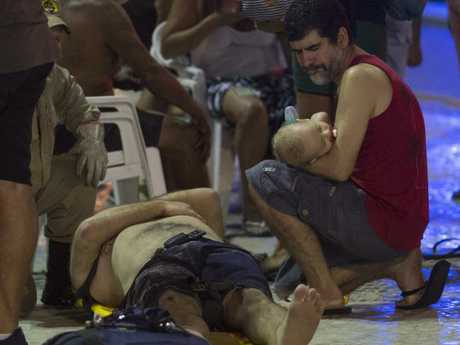 One eight-month-old baby was reportedly killed and Brazilian authorities say dozens of people have been injured. 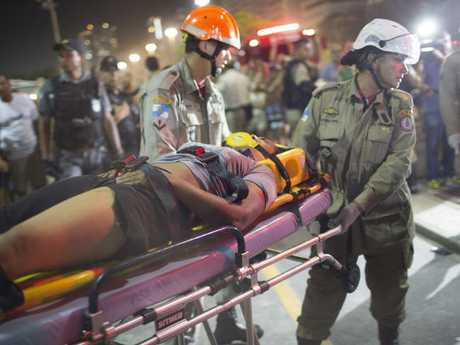 The Twitter account of Brazil's military police force says the driver in Thursday night's incident has been taken into custody. According to The Mirror, a fire department official said that an eight-month-old baby was killed. The car stopped in the sand after it apparently crossed the wide sidewalk that runs between the beach and a busy road. People were knocked down and lying on the ground. 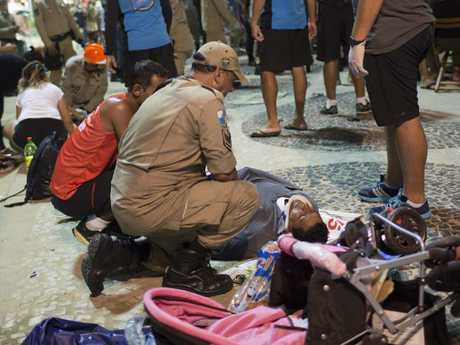 The injured have been transported to Rio's Miguel Couto and Souza Aguiar hospitals for treatment, officials said. The incident happened around 8pm local time (9am AEDT). 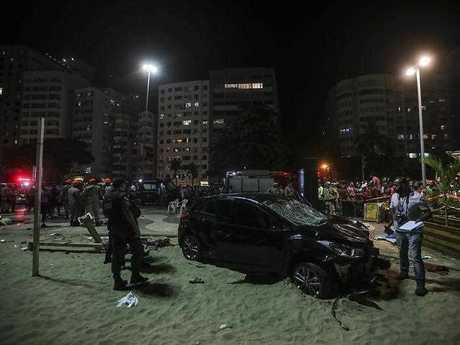 The black Hyundai was reportedly driving along Avenida Atlântica road before suddenly crossing a bike path and boardwalk, before coming to a stop on the beach, Express reports. Local police commander Colonel Angelotti said the crowd was angry, telling media, "We got there in time to keep (the driver) from being lynched", reports RT. 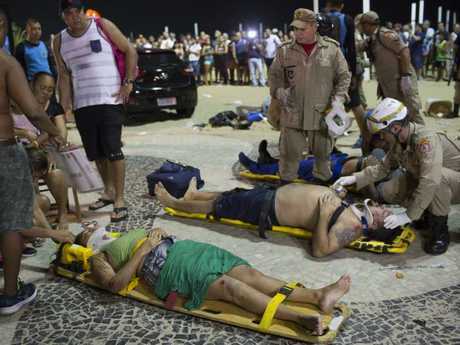 A witness, Magno Morais, said "it was shocking," according to Express. "We do not have a reaction at a time like this. "People wanted to lynch the driver, but police at the scene prevented it. There were a lot of people run down." RT also reported that the car was not believed to have been driving at high speed because of traffic congestion, but the beach had been crowded because it had been a 40-degree day. The driver, identified as 41-year-old Antonio de Almeida Anquim, tried to escape before being detained by police, according to reports. Some have said he suffered from an epileptic fit. According to RT, authorities reportedly found anti-epilepsy medication inside the car. Local journalists have reported that the driver has been taken to hospital where he is undergoing blood alchol tests. Police are investigating, but initial reports indicate that it is not terror related. Copacabana is Rio's most famous beach, a 4km-long stretch of sand bordered by the Avenue Atlantica. It was the site of the Beach Volleyball Arena during the 2016 Rio Olympics and is one of Barzil's most popular touirst drawcards. In 2013 an estimated crowd of one million people gathered on Copacabana for a mass delivered by Pope Francis during world Youth Day celebrations. Vehicle rammings are being reported with increasing frequency across the globe. In 2017 there were deadly vehicle attacks in New York, Barcelona and Charlottesville, as well as two such rammings in Melbourne.